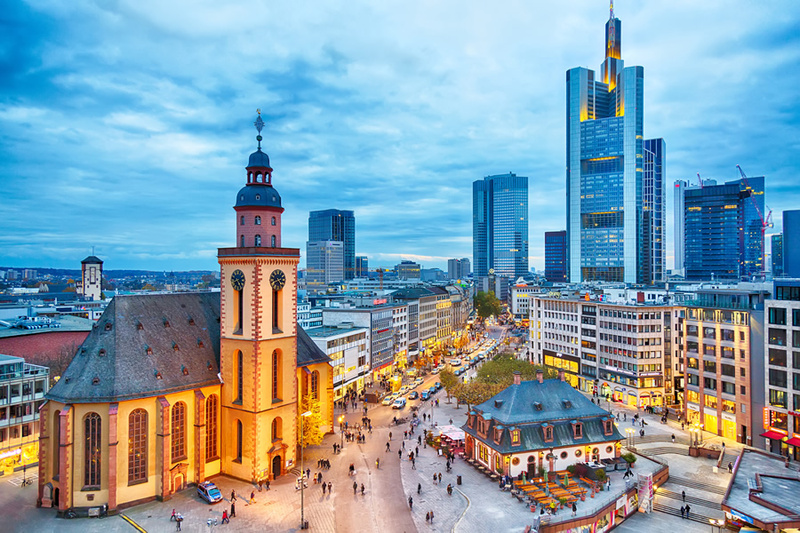 After arriving in Frankfurt, we will depart for our short flight to Split, Croatia where our motor coach will be waiting to transfer us to Medjugorje. We will check into our host home for dinner and overnight. Dinner provided by our host home. 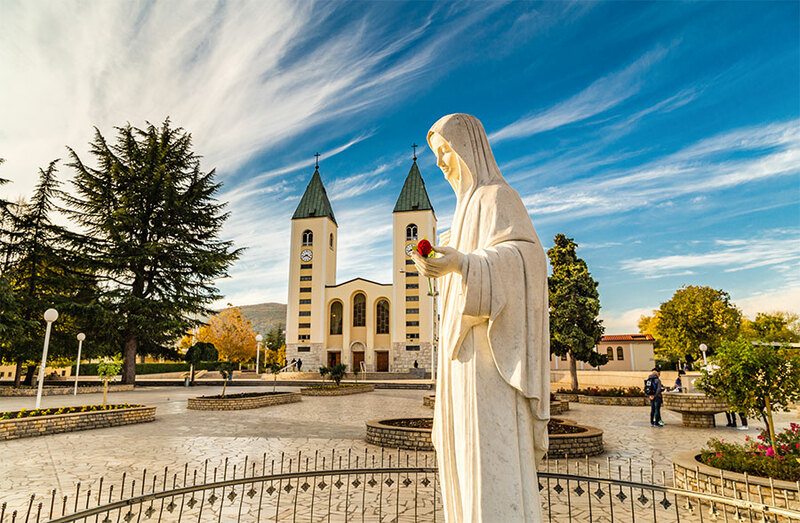 We will be in Medjugorje for 5 days and 6 nights. Our guide, Miki Musa will set the schedule each day depending on what is happening in Medjugorje. Holy Mass will be celebrated each day at St. James Church. We will attend a private talk with the visionary, Mirjana and have a group photo taken with her. We will also climb Apparition Hill and Cross Mountain, attend talks by the other visionaries or priests, as available, and visit the Cenacolo Community and Mother’s Village. We will attend Our Lady’s Apparition to Mirjana on October 2nd. Every evening at St. James, there is Rosary, International Mass and healing prayers. Adoration is available each afternoon from 2 to 5 PM and two or three evenings each week. Reconciliation is available each evening at 5 PM. Breakfast and an early Dinner provided each day while in Medjugorje. We depart Medjugorje in the afternoon and travel by private motor coach to Split, where we will catch our overnight ferry to Ancona, Italy. Breakfast and Lunch will be provided in Medjugorje; Dinner will be provided on the ferry. After breakfast, we will disembark the ferry in Ancona and travel by private motor coach to the Holy House of Loreto, alleged to be the house where Mary was born and raised. According to a 14th century legend, the Holy House was flown by angels to its present location to protect it from the Islam invasion of the Holy Land. Then we will continue to Montepello to visit the Basilica of the Holy Face where the Veronica Veil is kept. 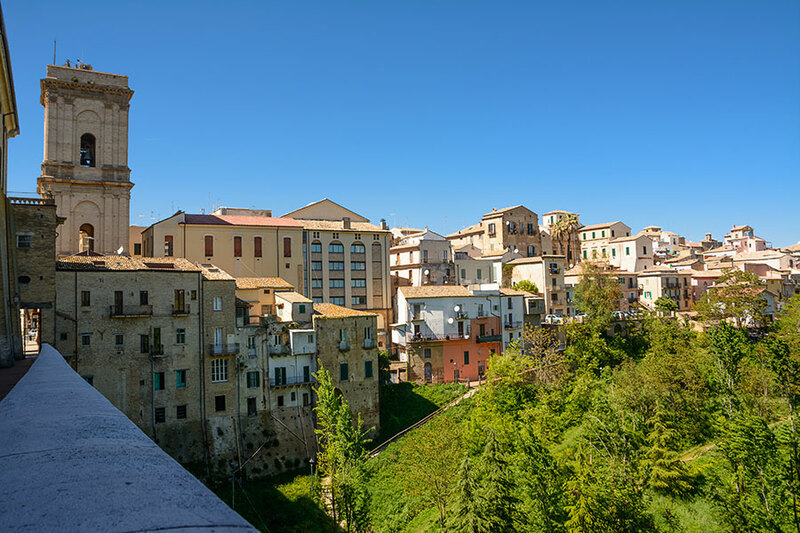 After departing Montepello, we will head to Lanciano to visit the site of the Eucharistic Miracle dating back to the 7th century. We will view a short film about the miracle and then Fr. Szymon will celebrate a private Holy Mass for us at the Chapel of the miracle where we will have the opportunity to view and pray before the bread and wine that changed to the flesh and blood of Our Savior. 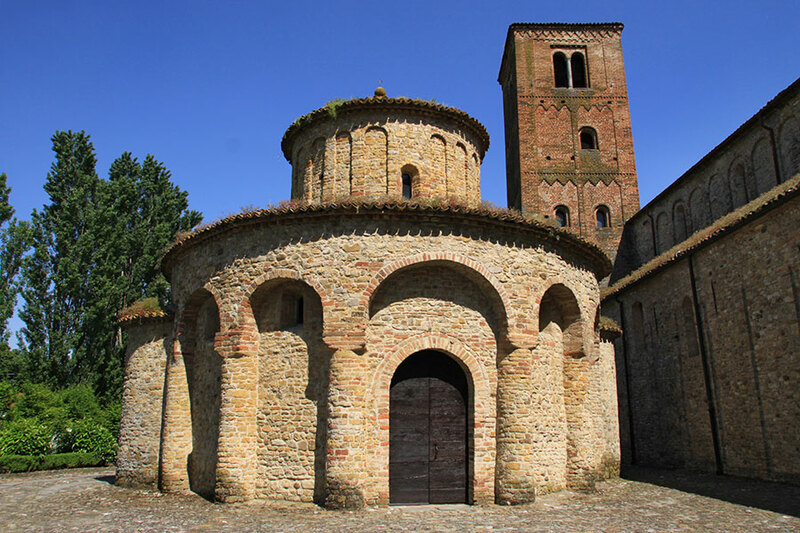 We will continue by private motor coach to our hotel in San Giovanni Rotundo, stopping for lunch on the way. Breakfast will be provided on the ferry; Lunch is on your own; Dinner will be provided by the hotel in San Giovanni Rotundo. After breakfast we will depart for Monte Sant Angelo (the Cave of St. Michael the Archangel). This is the only Catholic church in the world that has not been consecrated by a Bishop because it was consecrated by St. Michael the Archangel who appeared here on more than one occasion over the centuries. St. Padre Pio asked pilgrims to pray at this cave before coming to him for Confession. We will visit the cave and you will have some free time to pray and then grab some lunch. We will return to San Giovanni Rotundo to visit the Shrine of St. Padre Pio and Fr. Szymon will celebrate private Holy Mass for us at the very altar that St. Padre Pio celebrated his last Mass. After Mass we will have a guided tour of the Basilica, the cell where St. Padre Pio lived and died and the Shrine where we can view the incorrupt body of St. Padre Pio and pray for his intercession in our lives. After the tour, we will visit the English Office to see a short film about St. Padre Pio and Fr. Szymon will have an opportunity to bless each of us with a glove worn by the saint as well as his personal crucifix. We will return to our hotel for dinner. Breakfast and Dinner provided by the hotel; Lunch on your own. 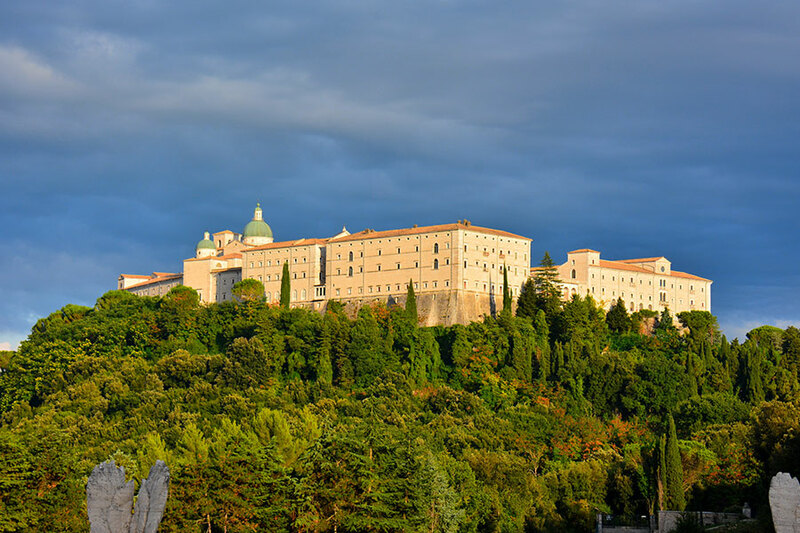 This morning we will depart by our private motor coach for the Monte Casino Abbey where St. Benedict lived and founded the Benedictines. Fr. Szymon will celebrate a private Holy Mass for us and then he will bless St. Benedict medals for each of us at the tombs of St. Benedict and his twin sister, St. Scholastica. From here, we will continue by motor coach to Rome. Breakfast provided by the hotel; Lunch and Dinner on your own. The morning after we arrive in Rome, we will have breakfast and then travel by the Metro to Santa Croce (the Church of the True Cross) to see the relics of the Passion brought to Rome by St. Helen. Then we will walk to the Basilica of St. John Lateran where Fr. Szymon will celebrate Holy Mass. After Mass we will walk across the street to climb the Holy Stairs. These stairs were brought from Jerusalem and are the very stairs that Jesus climbed for his judgement by Pontius Pilot. You will have the opportunity to climb them on your knees. We will then have lunch on our own. After lunch we will have a guided tour of the Basilica of St. John Lateran and the Basilica of St. Paul Outside the Wall. Then you are free for dinner and overnight at the hotel. Breakfast provided by the hotel; Lunch and Dinner on your own; Metro passes are also included while in Rome. This morning, we will depart by train for a day trip to Assisi where Fr. Szymon will celebrate a private Holy Mass at the Basilica of St. Francis, followed by a guided tour of the Basilica and the tomb of St. Francis. 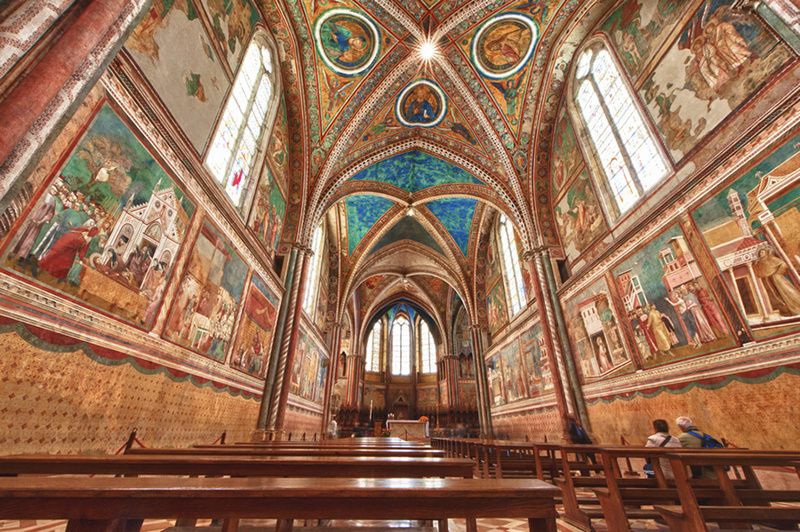 Then you can spend the remainder of the day enjoying the timeless beauty of Assisi, including a visit to the tomb of St. Clare or the original San Damiano cross. 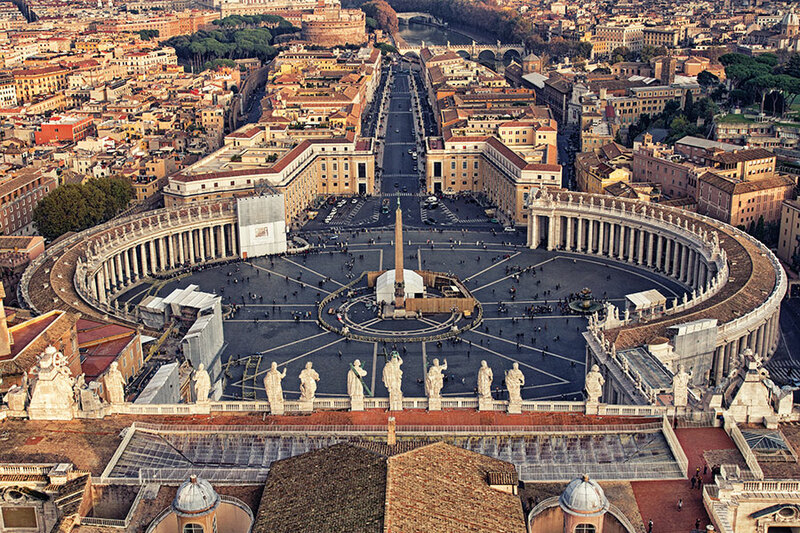 Today we rise early to go to Vatican Square to attend the papal audience with Pope Francis. After the papal audience we will have time for lunch on our own. 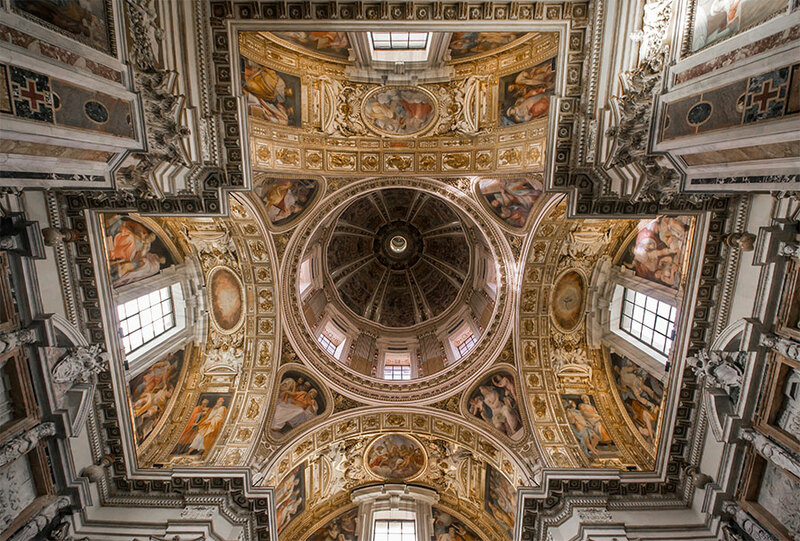 After lunch we will visit the Basilica of St Mary Major. This is where Pope Francis goes prior to traveling, to pray in front of the Icon of Our Lady. After touring the Basilica, Fr. Szymon will celebrate Holy Mass in one of the chapels. Afterward we can go to a small church near the Basilica that houses a piece of the pillar where Jesus was scourged. Then you have the evening free for dinner and overnight at the hotel. We will rise early and leave the hotel to go to St Peter’s Basilica where Fr. Szymon will celebrate Holy Mass at the altar at the crypt of Pope Saint John Paul II. After Mass, we will have a guided tour of the Basilica. 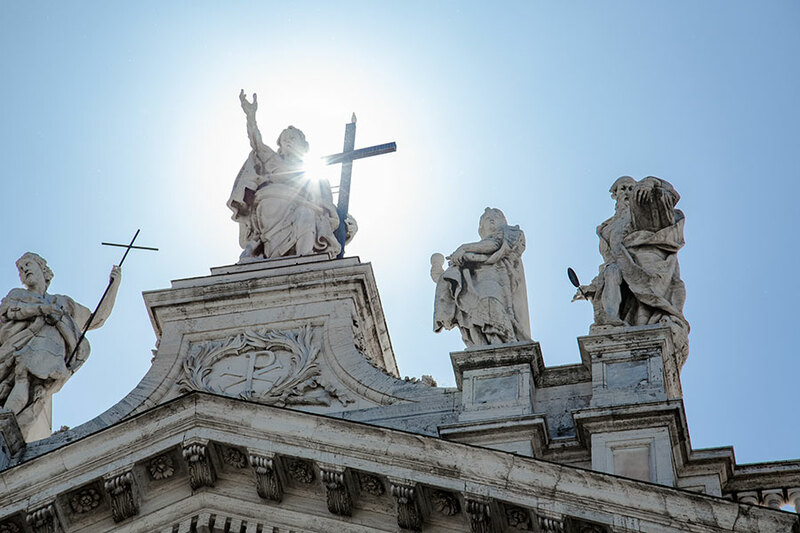 You will then have the remainder of the day free to explore Rome and visit any of the many sites such as the Vatican Museum and Sistine Chapel, the Coliseum, the Forum, Trevi Fountain or some of the other 700+ churches in Rome. This morning we say goodbye to Rome and carry our many memories of Medjugorje and Italy home with us.